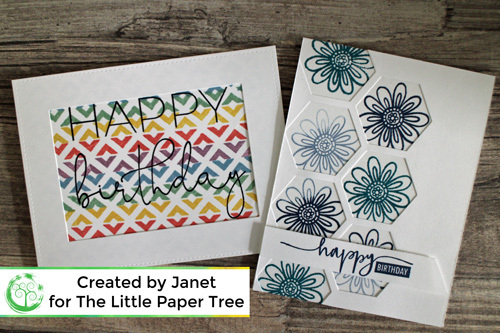 Hello, Janet here with two birthday cards using stamps and dies from the latest Stamp Of Approval collection, some Catherine Pooler stamps and Avery Elle stamps. I love mixing and matching brands to make my cards. Just because your products are from different brands doesn’t mean you can’t use them together. The Stamp Of Approval collection – Tropically Yours – is limited in number. See more SOA inspiration HERE. For the first card I used the ‘left over’ from diecutting the Cabana Tiles die as a guide to stamp the flower from the CPD Zen Flower stamp set and stamped the flower into each of the hexagon gaps onto my card base. The colours I used are Juniper Mist – 1st generation and 2nd generation and Daydream. I adhered the hexagon frame flat to the card base and added a sentiment banner with foam tape. The sentiment is from an Avery Elle stamp set with Juniper Mist ink. For my next card I used a geometric stamp from the Good Vibes Border stamp set and used it to create a rainbow pattern. The colours I used are Sea Foam, Shea Butter, Polished, Sugared Lavender and Stone Blue. To create the frame I die cut two of the Stitched Frame Dies by Lawn Fawn from a piece of white card. I stamped the sentiment Happy Birthday in Midnight ink onto the rainbow background. I adhered the background pattern onto a card base then adhered the frame piece. And my two cards are finished! Which is your favourite? Do you have a favourite use for the ‘left overs’ from your diecutting? You can find the supply list below with clickable links to the products in the online shop. Did you know that you earn loyalty points with each order (as long as you are logged into your customer account)? Your points only last 6 months – so don’t forget to come back and spend them!